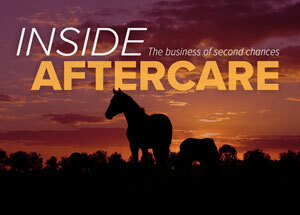 The words used when Thoroughbred aftercare is discussed may not paint an accurate picture of what actually happens when a horse leaves the track. While arguing semantics about off-track Thoroughbreds may seem unimportant, one group views changing the conversation as a major piece of the larger equine welfare puzzle. "Currently people just talk about 'horse rescue.' When you talk about 'horse rescue' it conjures up images in people's mind of lame, old, and unsound horses that can't be used for competition or riding, when in actuality that's not the case. We feel like there's a stigma around horse rescue that needs to be blown apart," said Christy Counts, president of The Right Horse, an initiative funded by the WaterShed Animal Fund, a division of the Arnall Family Foundation. The goal of The Right Horse initiative is to increase the number of successful horse re-homings, and one of their main focuses is working to improve public perception of horse adoption. The initiative launched in February and has already partnered with the ASPCA, the National Reining Horse Association, the United States Pony Clubs Inc., New Vocations Racehorse Adoption Program, and the Retired Racehorse Project, among others. "We started The Right Horse initiative because we took a deep dive into the topic of equine welfare and found after six months of research that there has never really been a widely supported collaborative effort to support horses in transition," Counts said. "We're calling them 'horses in transition' because in the vast majority of cases that horses fall at risk in this country there is no rescue needed," she added. "Most horses that fall into the wrong hands are healthy, adoptable horses that could easily move onto a new career." The initiative fits in with off-track Thoroughbreds, as those horses who train for a second career off the track are "in transition" and may not necessarily need to be "rescued." "We're talking about transitioning good, valuable, and useful horses. They are not in need of rescue. They're in need of people giving them a look and understanding they have value. By helping these (Thoroughbred retraining and adoption) groups market these horses and retrain them, we're helping them move a lot more horses. ... A tremendous number of these horses have great value and people don't consider adopting a transition horse when they are looking to get a new horse," Counts said. One racehorse retraining and adoption organization The Right Horse has partnered with is New Vocations. Counts said that the initiative was impressed by the number of horses New Vocations has moved into new homes (6,000 Thoroughbreds and Standardbreds since its founding in 1992). The long-term goal of The Right Horse in working with nonprofits like New Vocations is to exponentially grow the number of adoptions by supporting these groups that are successfully moving a significant number of horses into new homes. To help kick-start that goal, the initiative is offering a $150,000 grant to the organization that comes up with "the most innovative plan for boosting equine adoption." With all of the focus on retraining, even the word "aftercare" may not appropriately fit into the lexicon of off-track Thoroughbreds in second careers, at least to The Right Horse. "The Right Horse is not about sanctuary. It's not really about retirement," Counts said. "Our goal with off-track Thoroughbreds is getting the horses into a new role and a new home, not about aftercare." The industry change in mindset and vocabulary is not something The Right Horse expects to happen immediately. "This is a long-term movement. I think over the next 20 years that we're going to see a massive shift in the culture of equine welfare, and it starts with just the dialogue and the conversation," Counts said. "We feel like people do not care where their horse comes from as long as it's the right horse for them—horse people know when they have the right horse for them. If (the horse) does what you need it to do and you enjoy the horse, then it doesn't matter where it comes from."